1. How did you write your personal statement? Instead of trying to emphasise on WHAT I have that will allow me to cope with studying Pharmacy, I wrote more on WHY I want to study that particular programme. I think that made my personal statement stand out compared with the rest of the applicants, and gave me a boost. I am really lucky to have taken up multiple extra-curricular activities back when I was in secondary school. They linked well with what I was applying for. Also, before starting the personal statement, I read up many of other successful applicants’ personal statements (TBH I felt really intimidated because I have no work experience), and really explored the programme to its core. I included in my personal statement how I developed my interest in Pharmacy through studying Chemistry and my extra-curricular activities (mostly based in Leo and Interact). To further strengthen it, I wrote down my future career plans (after graduation) that I had in mind. I was really worried about not having sufficient work experiences and past achievements to support my personal statement other than one or two state championship awards. I am not sure whether I got my offers based on my personal statement or forecast grades though. 2. What do you think contributed to your success of your application? Leo and Interact made me aware that many people out there do not have access to simple medication, or even fresh water. They have also allowed me to taste the fruit of helping others. Self-satisfaction experienced. Model United Nations gave me the chance to discuss some of the serious issues in a semi-professional environment. It will help me in the future when I am involved in policy setting on national healthcare. Again, I really think that it is important to write on WHY we want to join the programme; instead of WHAT achievements we have and what kind of academic background we come from that enable us to complete the course. 3. Did you have to attend any interview sessions? I was asked to attend interview sessions by only 2 out of the 6 universities I applied to. The interview was actually a full test. It revolved around knowledge of pharmacy, Mathematics, Chemistry and moral. I was not notified that we would be given a test. I was only told that the multiple-mini-stations-interview technique would be adopted for the 1st time by Nottingham for the interview. I prepared by reading up on pharmacy, certain essential drugs and their functions, going through the background of some of the world’s largest pharmaceutical companies but they all ended up unused. I was really unprepared for a test. The test had 6 stations in total, conducted by the same academic staff. I finished my test pretty quickly (I skipped some because I didn’t know the answer), so I had a talk with the academic staff. She’s a pharmaceutical chemistry researcher in the university. Instead of having 1 academic staff for all 6 stations, we were required to switch seats and approach 6 different academic staffs for different stations. There are some additional questions. A group activity is organized, where applicants interact with each other and made decisions together. The atmosphere was very lively. 4. What advice would you give to future applicants? Be confident, and plan your personal statement well. 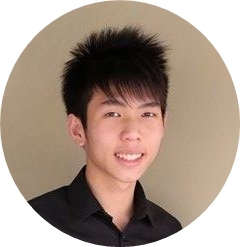 Liew Zhen Yuan Gary received offers from University College London, King’s College London, University of Manchester, but he has decided to pursue his Masters in Pharmacy in University of Nottingham (2+2 programme).